We’re back again, in another article of Mad About Science! Last time, we decided to look at how awesome explosions are, as well as the biggest types of explosions we’ve seen. Explosions are great and all, but who doesn’t like talking about dinosaurs? They’re big, they’re loud, they eat everything, and most importantly: They’re pretty cool looking! Today, I want to introduce you to some sweet relatives of terrifying monsters that decided dying to a giant asteroid was too mainstream, and instead stuck around to modern day. Crocodile = big, angry, hungry. Yeah, they’re cool and all, but their ancestral cousins are way, way cooler. 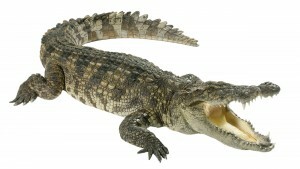 Let’s start with modern day crocodiles. TV Hosts have wrestled and flirted with these bad boys for years. At first glance, they don’t seem to have changed too much since the days nightmare-inducing superreptiles stormed around the Earth. They are also one of the most feared predators on the planet, and are prime contenders for one of the most powerful and devastating bites in the world. A crocodile’s bite has been measured to exert up to 3,700 PSI, or pounds per square inch, of force; to contrast, whenever you take a bite of a delicious bacon and swiss burger, you will exert roughly 150 PSI. Yeah, that’s great, crocodile. I didn’t want my bones in that painless configuration, anyway. Let’s just step into the time travel device we have handy here, fly back a little over 100 million years, and wow! Our next subject! Deinosuchus, with his strange and difficult to pronounce name, at first glance, looks like an alligator. We traveled that far back just to see an alligator? Yeah, we did, because that alligator is between 26 and 33 feet long! If you laid him out on a football field with the tip of his tail in the endzone, his nose would be touching the ten yard line, and there would probably be a bunch of football players running in fear. Despite the fact that the few fossils we’ve found of this big guy have been fairly fragmented, members of the scientific community have been able to piece together enough information to postulate rough size estimates on him, by comparing his bones to those from current alligators. There are full skeletal reconstructions in museums, which have allowed biologists to understand how it lived and fed. This guy may have been one of the first of his kind to utilize the infamous Death Roll when feeding. That was pretty great, or whatever, but I think you can do better, nature! I think you can show me something so giant and terrible that I wake up with night terrors ten years from now! Enter: Sarcosuchus Imperator. Besides having an indisputably awesome name, this beast could reach lengths of 38 feet. If you put him next to a school bus, he could slap his nose against the door and traumatize all of the children inside. As another example of his size, an average six foot tall man could lay down inside of his mouth. Not that anyone would willingly want to, or anything. Sarcosuchus also had an estimated weight of about 8.8 tons, which is around 17,600 pounds. That’s roughly how much six Mini Coopers weigh. Its bite, meanwhile, is projected to be close to 18,000 PSI. Concrete, you know, the hard stuff that everything is built on, can crack at 4000 PSI. How is does your paltry burger taste now, tiny little human?